This book may be purchased at www.familydoctorpress.com, and by calling 818.957.3000 for just $19.95 (plus tax where applicable). Cases of books are available for resale at a reduced price! 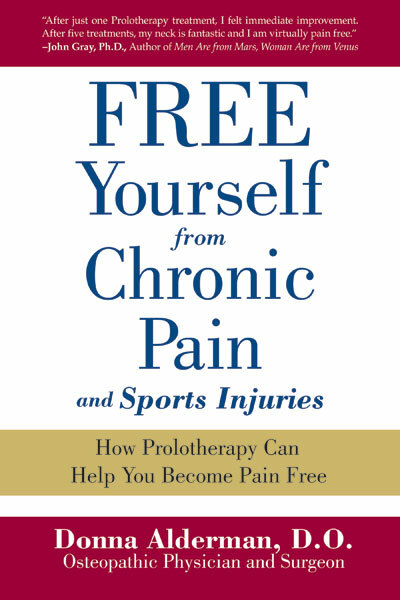 Dr. Alderman’s recent book is a “must read” addition to the growing body of literature about the medical treatment technique, Prolotherapy (also referred to as Regenerative Injection Therapy—RIT). Drawing on her 15 years of experience employing the technique, her substantial knowledge of the medical literature, and wisdom imparted to her by elders in the field, she has produced a book that is accessible and informative for both patients and practitioners. This book leaves one with the strong impression that, first and foremost, Dr. Alderman cares about her patients. She organizes her book around a large number of actual patient stories. While her book has a strong scientific basis (heavily footnoted and annotated), she starts with real problems in real people to explain why the science is important. She does a particularly skillful job of providing enough references to the scientific literature to give a practitioner confidence that her viewpoints are solidly based on science, while at the same time, not taxing those readers who are not trained in the healing arts—those who are just trying to find a cure for pain and need a layman’s understanding of Prolotherapy. She thoroughly, but concisely, introduces the reader to the basic diagnostic concepts and treatment strategies utilized by Prolotherapists. Through the course of the book the diagnostic dilemma posed by pain originating in connective tissue is highlighted and explained—many patients come to Prolotherapists with one or many incorrect “diagnoses.” She highlights various disease conditions that can be treated successfully. Dr. Alderman explains the technique of Prolotherapy, again emphasizing what a person will actually experience while undergoing treatment. She relates her own story—how she was frustrated by the lack of results using “traditional” approaches to various joint and body pains, and how exciting it was to find a treatment technique that consistently provided outstanding results in these same patients. She deals with the issue of skepticism that many people feel examining a treatment that is not universally practiced—her own mother referred to her as the “voodoo doctor”—until Prolotherapy healed her mother’s knee pain. Many people would be helped by this book. It would be an excellent resource in a Prolotherapist’s waiting room, or a nice gift for any health professional. It would be particularly suited for our friends and relatives who are suffering needlessly with connective tissue pain.